Want a great way to cleanse and tone your skin AND show your support against breast cancer? Then check out the pink Spa Sonic Face and Body Polisher! Spa Sonic deep cleanses the entire face and body and tones the skin. Spa Sonic Skin Care System Face and Body Polisher is a waterproof device which is ideal for use in the shower, bath and sink. It operates with 4 attachments (all included): A small brush for the face, a large brush for the body, pumice for rough areas, and a facial sponge for microdermabrasion and reduction of fine lines. 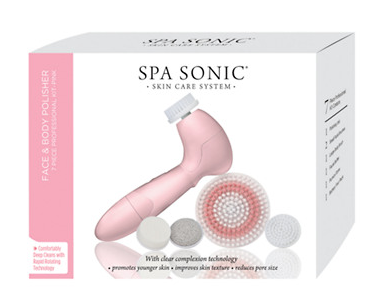 Buy It: You can purchase the Spa Sonic Face and Body Polisher for an ARV of $69.99. Win It: Spa Sonic is generously offering (1) Spa Sonic Face and Body Polisher to a lucky winner!